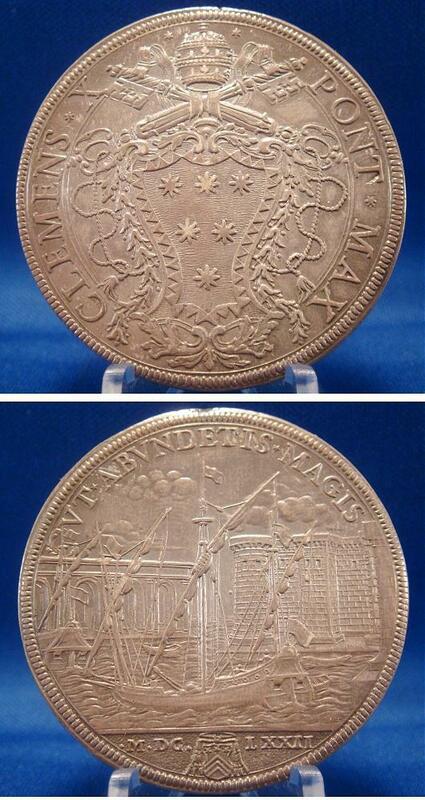 1672 Piastra (Scudo of 80 Bolognini) of Pope Clement X. Obverse: Coat of arms. Reverse: The port of Civitavecchia; in exergue, the arms of Monsignor Costaguti. For the important work in restoring the port by the Pontiff. Very attractive original toning, mount removed, About Unc condition. A real beauty of a very scarce type! Attributable to Alberto Hamerani.